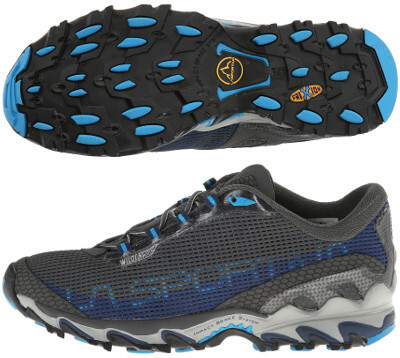 La Sportiva Wild Cat 3 are neutral trail running shoes. The Wild Cat 3 is a trail running shoe for long distances from italian brand La Sportiva. With great cushioning and stiffness fit is not as popular as the premium Ultra Raptor but a really versatile one if we skip fast tracks. Major change from its predecessor Wild Cat 2 is a simpler upper where some elements have been removed (or simplified like toe cap) for improved breathability resulting a lighter shoe. The hoop lacing system combined with thinner tongue features a custom snugger fit. 4 mm Ortholite® footbed provides not only extra comfort but also enhanced antibacterial treatment. The Wild Cat 3 keeps the realiable injected EVA cushioning, rock plate under forefoot to protect against sharp objects, classical 12 mm drop and well known FriXian AT outsole with more focus on durability than grip. La Sportiva's Impact Brake System based on lug position and geometry tries to get more traction on downhills improving shock absorption. Check availability for GTX (Gore-Tex®) edition to protect feet under extreme weather conditions.